Last night, I pulled out a few cookbooks hoping I would find a recipe for a good "drop biscuit." I wanted biscuits, but I wanted to be lazy. 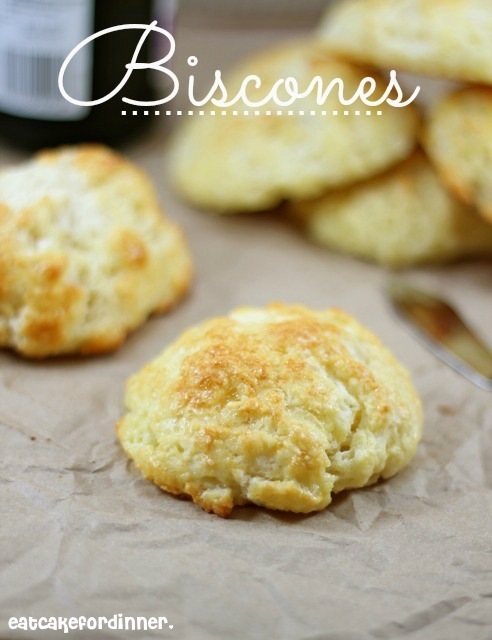 I saw these biscones in one of the cutest cookbooks I have and remembered I have been wanting to try them since I first saw them on a Paula Deen episode a few years ago. I finally tried them and realized I have been missing out all these years. 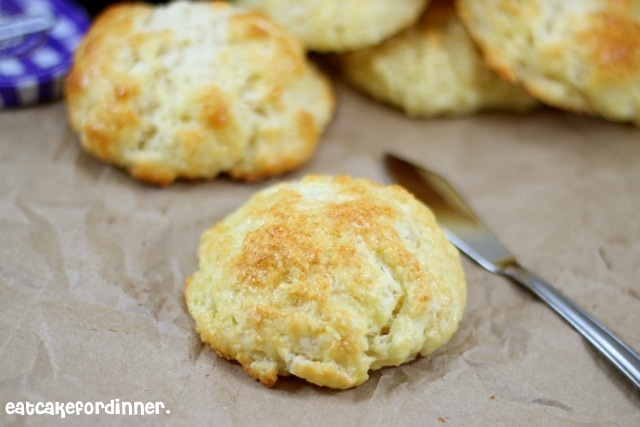 They are a perfect cross between a flaky biscuit with the rich buttery flavor of a scone. These are Absolutely DELICIOUS and incredibly soft and tender. How could you not love them? Brush tops generously with a beaten egg. Bake, smother with jam and enjoy every last crumb. Preheat oven to 375 degrees. Line a baking sheet with parchment paper. In a large mixing bowl, combine the flours, sugar, baking powder and salt and whisk until completely incorporated. Add the butter and working quickly, cut it in with a pastry cutter. You should have various-sized pieces of butter, from sandy patches to pea-sized chunks and some large bits as well. Gradually pour in the buttermilk and gently fold the ingredients until you have a soft dough and there are no bits of flour in the bottom of the bowl. 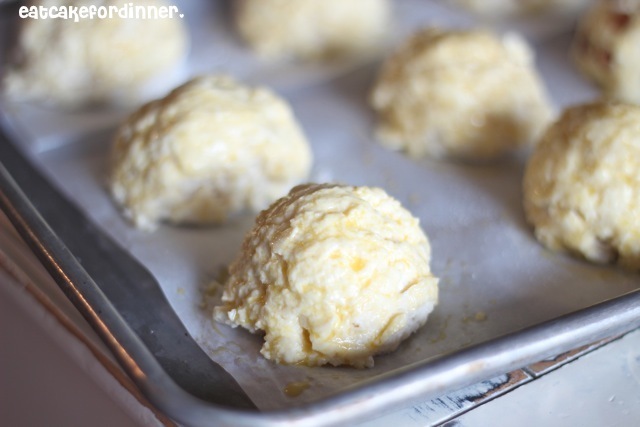 You should still see lumps of butter in the dough; these will give you light and flaky biscones. If the dough seems dry, you may need to add a little more buttermilk. The dough should be moist and slightly sticky. Do not over work the dough. Jenn's Notes: These are so good. I made the recipe "as is" and they were perfect. I baked mine for 25 minutes. Ach! 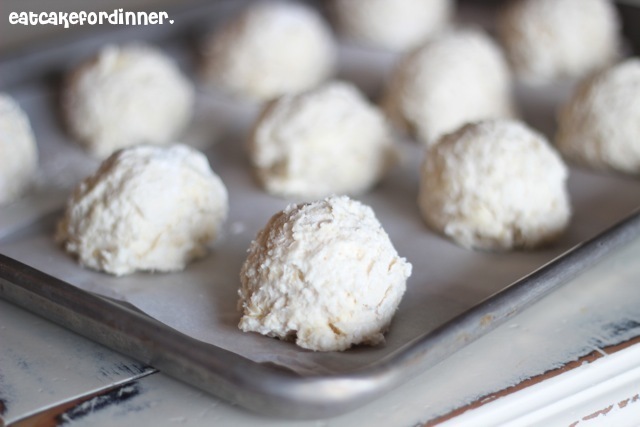 I have everything to make these but the buttermilk. They look divine. Can't wait to try them! YUMMY can't wait to try. Wow- I can't wait to try these! 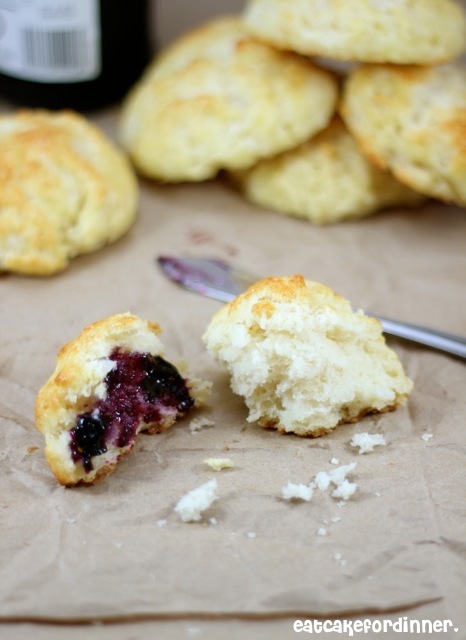 I love biscuits and scones, so these are on my must-try list! PINNING! Would these work w/o the cake flour & w/ reg milk or milk w/ a bit of vinegar to make it buttermilk? The cake flour helps give them a light texture. If you don't have cake flour, then you can substitute all purpose flour and cornstarch. For every cup of cake flour called for, you can use one cup of all purpose flour minus 2 Tablespoons and replace that 2 Tablespoons with cornstarch. Make sure to sift those two ingredients together a few times. For the buttermilk, I would use milk mixed with vinegar. I haven't tried either of these substitutions in this recipe, but I'm sure it will work just fine.